Many of you received an end of year summary letter from Eyes from the Ashes Educational Foundation. For those of you who did not receive the letter, and would like to see what we’ve been doing, please click here. As promised, here is further information about photos. Consider helping to support this work with your tax exempt donation, deductible to the fullest extent permissible by law. To donate please click here. 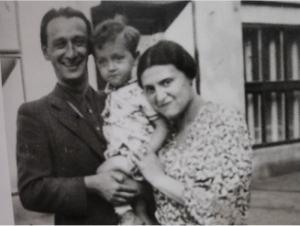 Here is the same couple, Grete and Artur, a few years later, with their only child, Peterle. Minka (last name unknown) is featured in a number of photos, and she always seems to be having fun. No further information about her is known. 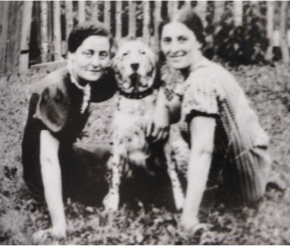 Although their names are not known, these women did what many others also chose to do: bring photos of beloved pets to Auschwitz, where they believed they would be worked, not murdered. Names not yet known. Artur Huppert and his only child, Peterle are seen three years after the wedding. 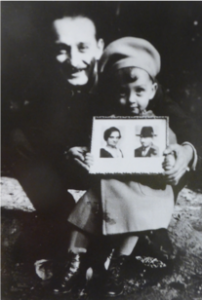 Artur, who lived in Czechoslovakia with his wife and child, found an ingenious way to create a three-generation family portrait which includes his parents, Rosinka and Jusekl (Rose and Joseph), who lived in Poland. 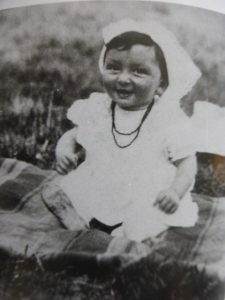 Taken in 1941, it is most probable that Rozinka and Jusekl carried this photo to Auschwitz-Birkenau where they were deported. 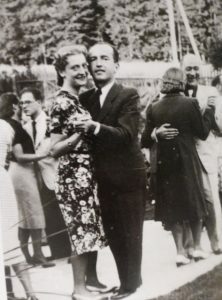 Dancing cheek to cheek, Ania Igra and Jakub Jakubowicz were married before the war. 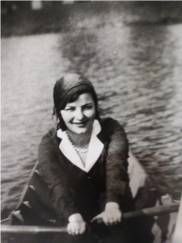 According to her brother and sister-in-law, they had an intensely close marriage and were deeply in love. When the Germans burned the Great Synagogue in Sosnowiec, the family knew they must devise a plan to escape. Because they were so well-known in their city, they moved to Warsaw, where they could hide their Jewish identity. Ania, with her blond hair and blue eyes succeeded in passing as an Aryan. Jakub was not so successful. 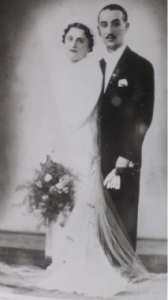 He died in the Polish Warsaw Uprising, and as Ania often said, she felt herself blessed to have had such a wonderful husband as Jakub. Baby on blanket, unidentified. Because the youngest and the oldest were the most vulnerable, it is most probable that this child did not survive the war. It is unclear whether the card players are really so intent on their cards that they are unaware of the photographer, or they are pretending to be. 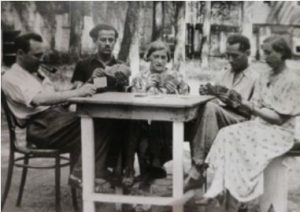 Card players include (at right) Mania Englar Cukierman. 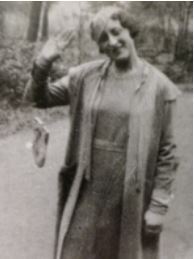 This final photo of a woman waving goodbye has not yet been identified. It is emblematic of the whole collection—a final goodbye.